Everyone needs a little romance in their life, and by the same token, a little romance book never hurt either. That Part was True reminded me of a Nicholas Sparks story, so that should give you an idea of what you’re in for if you pick up this book. Mind you, I’ve never actually read Nicholas Sparks, but I have a pretty good idea of what his books involve, and he wrote The Notebook (along with a bunch of other books that have turned into popular movies) so you get my gist. And if you don’t, click here to find out whether you’ve actually watched a Nicholas Sparks movie in the past-you probably have. That Part Was True is a quick little read-perfect for the beach, or if you live in Canada and it’s February, perfect to read by the fireplace with a glass of wine in your hand. Time for another teachable moment here-this book is also considered an epistolary novel (at least, part of it is) so the storyline is told through letters and correspondence between characters. This is a great way to tell a story because it forces the reader to infer things on their own, and it also breaks up the monotony of a long page with no paragraph breaks; the letters themselves are typically written in a different font, with a different voice. 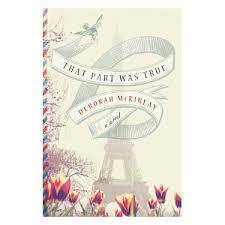 I must admit I don’t know much about Deborah McKinlay-after doing a quick internet search about her, it seems as though she’s written a few novels, and lives in the UK. She’s also got a great little website, and some sort of alter ego, so it’s worth checking out here. I won’t bother going into anymore detail about this book, because I think after reading the first paragraph of my post you’ll know right away whether you actually want to read the novel or not. Take my word for it, it’s fun and worth the hour or two you’ll spend reading it. Previous Previous post: Are you Addicted to Books?